My boys were so excited as they anticipated the end of the week. Their good friend was coming over to hangout and sleep over. There would be chess matches and football games, talk of sports, and a bit more football. Their hands and fingers would intertwine as they greeted. Their arms would embrace each other as they departed. Friends. As the events in Charlottesville unfolded that same weekend, I would steal small glimpses of the images on the computer as the boys came in and out of the house. When I knew that they would be occupied for a bit, I turned on the television to see with greater clarity the events that were transpiring. I was saddened beyond words, and I struggled as I attempted to try and understand how some could hold so much hate within their soul. As the sweaty brood of boys crashed through the front door, I quickly turned the television off. They ran into the kitchen for water and snacks, then proceeded to collapse in the living room. As I listened in as they described their football game at the high school’s new field, I couldn’t help but study the faces of the boys ever so closely. I took note of something that I always knew was there but never really thought about: the stark contrast of their skin. We are white. Their friend is African-American. I can’t begin to tell you how it pains me to even type those words here, how it literally hurts for me to separate these boys, these friends, into categories for the purpose of this post. Our family views race as an expression of beauty and uniqueness from our Most Awesome Creator. The Lord draws no lines, there is no separation, no difference in value or equality among man in His sight. Man looks at the outward, yet God, looks at the heart. We have chosen to do the same. I know that our attempts have failed at times. As the weekend came to a close and the boys said their goodbyes, my curiosity was piqued. Do the boys even regard each other’s skin color as a difference? I decided to find out and asked my friend to do the same with her son (age 14). So we set out to question the boys as to what similarities and differences the boys have. As I sat down with each of my sons (ages 17, 15, and 12) in private, I took note of their answers. I waited. Would one of them even bring up race or color? Would their friend? They noted differences in age, in where they lived, in the grade they were in, the sports they liked, the teams they supported, and the foods they enjoyed. They identified similarities in faith, the fact that they were all homeschooled, and in their love of sports and competition. Friends. They are simply friends, and that’s all that matters to them. Oh, if the world were more childlike. So, the boys and I sat down and talked about the real purpose behind my questioning. We discussed the events in Virginia. Although it was likely lacking, I did my best to discuss racism. Then one of my boys piped up,”But, mom, that stuff doesn’t happen today.” And yet again, I find myself in that terrible place as a mom where I take away a bit more of their innocence, where I wipe away their “rose-colored-glasses” view of the world. But this is their world, and I will soon be releasing them into it as they make their own way. They must know, they simply must, because if they don’t know the truth, how can they be the difference? That afternoon the face of racism became a bit more personal to my boys. I forced them to imagine how their friend would feel when encountered with such senseless hatred. In all honesty, they grappled over why some would harbor such hatred based on skin color. It’s just something they can’t understand. As a mom, I am thankful that they can’t relate to that kind of hatred. Yet, they must be sensitive to the fact that it is present and that it does affect people’s lives. They must be willing to stand up against it, to say something without hesitation, lest their silence be taken for acceptance. I wish that could be the end of the story. I wish that everyone would just replace hate with love. But, there is sin and depravity and brokenness in the heart of man, and ultimately, the only solution is Christ. On this side of heaven, the battle will rage on. Unfortunately, it will always exist and there will likely be witnesses to and victims of more hate-filled behavior. How do we stop it? How do we change the course? Well, we start at home. We are honest at home. We discuss the difficult matters. We talk about how each of us can be that much needed difference. We learn about the real story of history. We think outside of our homogeneous neighborhood and town. We expand our personal borders to include those who may be different than us. We share a phone call, an embrace, a meal. We make sure that through our front doors “sameness” is not the only guest. We fill our yards with the beauty that is color. We take a stand, a visible and audible one. We talk about it with those who are affected instead of pretending there is no need for dialogue. We acknowledge when we fall short or when we succumb to hidden prejudices. Imagine if we all did this? Father’s Day comes and goes each year. It’s one of those bittersweet days. I love to celebrate my husband and the wonderful dad that he is to our boys. Yet, inevitably, at some point during the day, I reflect on my own dad. Our journey as father and daughter was an interesting one. I learned some of life’s greatest lessons from my dad. Our story is marked by a sad beginning, a turbulent middle, and redemptive ending. I hope you’ll stick with me. It was Thanksgiving evening. Dinner was done, guests had said their goodbyes, and the house was in a bit of disarray. I was only five years old, my younger brother a year and a half. I obviously don’t remember the specifics of the day, but nonetheless, that Thanksgiving would be a momentous one. For on that day my dad left. Simply took his belonging and walked away. Our lives were changed in an instant. My father returned to the Bronx where he took up residence in his mother’s spare bedroom. To my father’s credit he remained involved with my brother and me. We regularly spent time with my dad and grandmother. He helped my mother out financially and maintained the house. And while I was too young to fully understand our new family arrangement, it all just seemed odd to me. However, I looked forward to those weekend trips. I remember one specific visit where my father introduced my brother and me to a new “friend”. She was apparently someone that my father had known for quite some time. It was then that my young mind began to put the sordid pieces together. My mother would fill in the gaps for me. Within two years my parents’ divorce was finalized, and soon after, my father would remarry. His new wife, the woman with whom he had been involved with while married, was young, and I frankly never gave her a chance. I would not allow myself to like her. I would not allow my heart to be open to her. My mind was made up. Future visits with my dad were marked by tears, unhappiness, and loneliness. And as my father and wife began their new lives together, my sadness would turn to anger. While my mom struggled to put food on the table, when there were times when the electricity was shut off, when birthdays went by without a gift, my father seemingly basked in the glow of his new home, new car, new toys, and new children. Our twice monthly visits would become monthly visits, then every other month visits, then holiday and birthday visits, then would simply fade away. Our visits were replaced with phone calls that were more obligatory than anything else. My anger was slowly turning to hatred. I entered high school seemingly happy on the outside but longing for love and acceptance on the inside. I am fully aware that many young people in similar situations can get themselves into trouble, can wander down the wrong path, can look for love in all the wrong places. I was fortunate, for the Lord put a father figure in my life in high school. I was in the band, and the band was my life. Our band director really became my dad during those vital years. He took a genuine interest in my life. He went so far as to having me over to his house for dinner with his family. I imagine that there were plenty of fellow classmates who envisioned a “Mr. Holland’s Opus” story line, but no, that was the farthest thing from the truth. To me, this man was the closest thing I had to a father. While high school graduation was a happy time for most, it was terrifying to me. All of the stability, acceptance, and love I received from friends and others would dissipate as we all went in our separate directions. I remained local and commuted to a nearby university. It was there that I realized how easy it was to find love and acceptance in the arms of all the wrong people. I was desperately looking to fill the void. I look back on that time now and see how the hand of the Lord protected me. I put myself into some precarious situations, some, downright dangerous. Yet, amazingly I was kept safe. I should have been an 11:00 news story. By this time in my life, I was a strong, independent, self-reliant young woman, but on the inside, there was that little girl, immature, vulnerable, naive, and hurt. The gap between my father and me was now a wide chasm. I hated him. I vowed that he would never earn my forgiveness for he was too undeserving. I would never allow all the years of pain and hurt to be erased. I would never give him a pass. He would never walk me down the aisle. I remember making a statement once that I wouldn’t even care if he died. Those feelings don’t just happen overnight. There is a progression. Hurt – Sadness – Anger – Hatred – Bitterness. Each one building off the last; each one defining more of who I was. I realize now what I couldn’t see then: hatred and bitterness did more to harm me, than my dad. I carried around a backpack full of burdens everywhere I went. It dragged me down into the muck and the mire. My deliberate attempt to hurt my father, resulted in only one person being hurt…me. For those of you who know me, you may have picked up on the fact that there is something missing from the above story: the Lord. I was saved early and grew up in the church, however, the older I got, the more I simply ran through the motions of religion. There was no relationship with the Lord, and that was obvious. It was during those turbulent college years that the Lord would grab hold of me. In reality, He had never let go of me, but He had to shake me pretty hard in order to get my attention. Through accidents, sickness, and heartbreak, the Lord would bring me to my knees. He would open my eyes to the self destructive path I was on. One night after returning home from class, I sat on the hood of my car and stared out into the starry sky. I broke down in tears and cried out to the Lord. Life wasn’t good; I had no joy, no peace, and no hope. It was then that I realized that the love I had been searching for all of those years was always there. It wasn’t to be found in my earthly father but in my Heavenly Father. I took a vow that night, a rededication of sorts, to simply stop what I was doing. I was going to let the Lord direct my path. Not surprisingly, our faithful God did direct my path. Within a few months he ordered my life and brought stability to it. I met my future husband, graduated college, and got into the workforce. In due time I would become engaged, and as I began to plan for my new life, the Lord reminded me that I still needed to deal with my old one. He impressed upon me that if I didn’t deal with my dad and my feelings, I would bring a lot of baggage into my marriage. After much prayer I decided to write a letter to my father. It was a long one. It was respectful but honest and blunt. I intended to mail it to him, but the letter never made it to the post office. This would be something I needed to do face to face. I called my dad and told him that I needed to talk with him. I warned him that I needed to get some things off of my chest. So we set a date and my fiance and I sat down at my father’s kitchen table with my dad and his wife. I read my letter to them. Twenty years of hurt and anger were laid out on the table. There wasn’t much conversation to be had, just a lot of listening. He didn’t dispute anything I had to say. At the end, I told my dad that I forgave him, words I never thought I would utter. With that, we left. As the door closed behind me, I felt the weight of that burdensome pack fall off. I hadn’t realized how the weight of hatred had been holding me down. I felt free…literally. Soon after, I was married. My father attended the wedding with his wife. My mother and brother walked me down the aisle, not out of spite, but out of love. I danced with my brother, not my father, again not out of spite, but out of love for my brother. With time, my husband and I would reach out to my dad. It was a bit awkward at first for everyone, but new beginnings have to start somewhere. We had occasional phone conversations and a visit here and there. We didn’t focus on the past but on the present. Yep. That’s exactly what I was called to do. 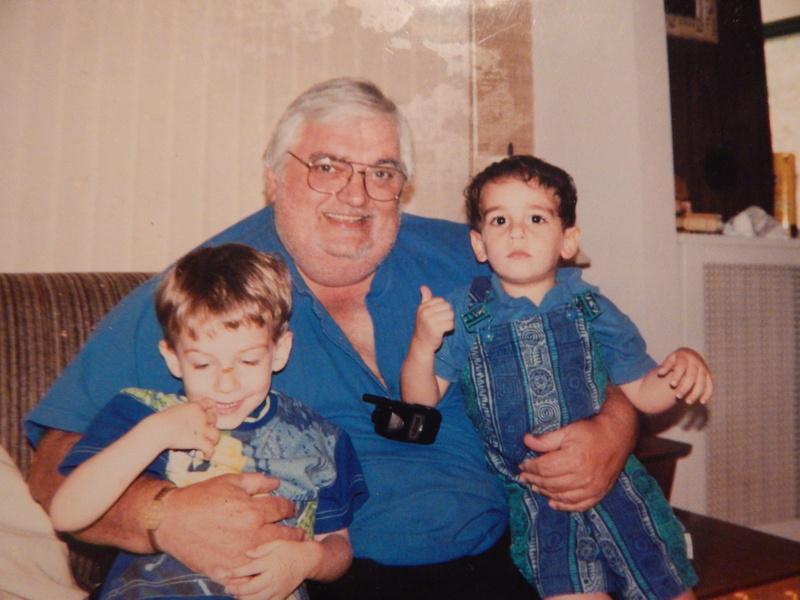 I had forgiven my dad….or so I thought I had. That verse hit me right between the eyes. What does true forgiveness look like? It is choosing not to remember the past. It is putting it away, far away from our minds. I don’t believe that we can truly forgive and forget. Our minds are not set up in a way to completely forget. All of our life experiences make us who we are. We just can’t pretend they aren’t there. But, we can choose to not remember them. When I looked at my dad, I still saw a little bit of the hurt. I hadn’t let that all go. So how do I really accomplish this forgiveness thing? Well, I didn’t need to look far to find the perfect example in God himself. I surely was not (and am not) without sin. I had done some downright ugly things. I turned my back on the Lord. I was in need of forgiveness. I sought forgiveness and it was granted to me. How did the Lord view me? Once forgiven, the Lord doesn’t look at me the same. He doesn’t look at me and see my sin; He sees me as new. He chooses not to remember my sins. If the Lord did that for me, how could I do anything less for my dad? And from that day on, I chose not to remember. I chose to see my dad for who he was now, not who he was then. And as a result, the Lord blessed me with a good relationship with my dad. I looked forward to visits with my dad. I found joy in seeing him be a grandpa. I enjoyed our conversations. I would chuckle as he would call me from Target to find out what size the boys were wearing or ask me if the boys would like a certain toy. And with time I heard something from my dad that I never heard before, “I love you.” And for the first time in my life, I knew he meant it. Priceless. The Lord would grant me only but a few years to enjoy this new found relationship with my dad. Oh, but how thankful I am for those years no matter how short they were. So, today I remember my dad for the good dad he was, for the great grandpa he was, for the changed man he became, and for the great lesson of forgiveness and love I learned through him. Love and miss ya, Dad! I entered high school seemingly happy on the outside but longing for love and acceptance on the inside. I am fully aware that many young people in similar situations can get themselves into trouble, can wander down the wrong path, can look for love in all the wrong places. I was fortunate, for the Lord put a father figure in my life in high school. I was in the band, and the band was my life. Our band director really became my dad during those vital years. He took a genuine interest in my life. He went so far as to having me over to his house for dinner with his family. I imagine that there were plenty of fellow classmates who envisioned a “Mr. Holland’s Opus” storyline, but no, that was the farthest thing from the truth. To me, this man was the closest thing I had to a father.